With easy access to digital prints, making a personalized cup or plate can be a great gift for a friend or family member. This is a guide about transferring a picture to a cup or plate. How do I transfer a photo to a plate or cup? There are kits available in craft stores like Michael's, that allows you to do it. I think the dish or plate has to be made from a certain composite that will allow the heat to seal the photo on the surface. I have also seen kiosks in the local malls here that can do it. They are a bit pricey but the quality they display looks very good. Photos are crisp and not blurry. 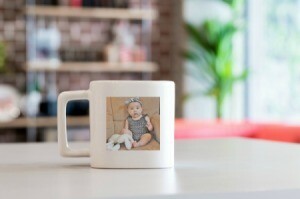 Any company that specializes in sublimation can do this for you. Unless you decoupage the item (which then means that it cannot be used for food/drink), you will probably need to have someone with a proper heat press and sublimation equipment do it for you. This is not a process easily or cost effectively done at home. I'm looking for information on how to transfer a picture on to a cup or plate. I know how to use an iron-on to put a picture on a T-Shirt. Can I use a similar method to iron a picture on a cup? Any information would be helpful. If you don't need them to be dishwasher proof, you could just print your picture on decal stuff from Wal-mart, cut it out and stick it on there. Mine are dishwasher proof, btw. This plate procedure is simply for decorative use. I have used the decoupage method of transferring pictures onto clear glass plates. I begin with a copy of the picture. It is much easier to adhere the picture, to the plate, than photo paper, because of the texture. " I used standard typing paper". First cut the photo out, and place behind the plate, (facing toward you) along with all the other pieces that will be glued onto the back of the plate. This step is just to preview the finished plate. Then, begin by spreading a thin layer of Elmer's or decoupage glue, onto the back of the plate. Before putting glue on the front side, of the picture, moisten the back of it with a washcloth or a spray bottle (be careful not to pull, it might tear, just press moisture into the paper(it will make it easier to work with), now pour ample amount of glue onto the photo. Lay your picture front side down onto the back of the plate. Press out all bubbles and wrinkles, using your fingers is best. Then continue with background pieces. (You can use almost anything as a background: gift wrap, tissue paper, more pictures- to make a collage, napkins, or wait till it dries and paint it with acrylic paints. To seal you may use special sealers, clear spray paint or layer the glue in several coats allowing it to dry in between coats. I hope this is what you need! NEED, 1 clear plate or cup. Decoupage medium; brush or sponge applicator. Aerosol acrylic sealer and sponge or brayer. Now, apply a thin layer of decoupage medium to the front of picture using a sponge applicator. Position the picture on the back of the plate; smooth out bubbles or wrinkles, using a sponge. Allow decoupage to dry. I'm ordering some to put a picture of my parents on a plate. The plate is the only piece left from their first dishes when they were married over 60 years ago. I can't wait to see how it works.